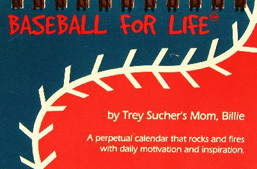 Written by a baseball player's mother, Trey's Mom (Billie Sucher), BASEBALL FOR LIFE® contains 366 baseball-related terms in alphabetical order, A to Z, January 1 to December 31. Each baseball word, term, or phrase is followed by a one-liner about life that Trey's Mom wanted her son to know as he headed off to college and then law school. BASEBALL FOR LIFE® is a fun, uplifting, and thought-provoking collection of wisdom and nuggets for baseball lovers of the world. The calendar's perpetual nature makes it a treasured companion, year after year. 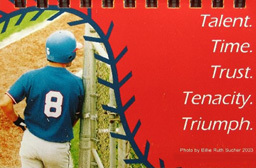 BASEBALL FOR LIFE®, a way of life, is a perfect gift for baseball fans, coaches, and players of all ages! To order your copy now, contact Billie. Site Design By CooverGroup · Copyright © 2019 Billie Sucher & Associates.